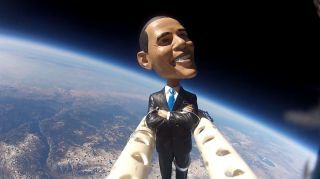 Middle and high school students of the Earth to Sky Calculus club project in Bishop, Calif., launched a bobblehead toy of President Barack Obama into the stratosphere on Nov. 5, 2012, one day before Election Day, using a high-altitude balloon that reached 120,000 feet. The U.S. presidential campaign was a political rollercoaster ride for Barack Obama and Mitt Romney, but it couldn't compare to the ride their bobblehead dolls took earlier this week. On Monday (Nov. 5) — the day before President Obama defeated Romney to win a second term in the White House — a group of California schoolkids launched bobbleheads of the two candidates to the stratosphere aboard a high-altitude balloon. Middle and high school students in the Earth to Sky Calculus club launched a bobblehead of Mitt Romney into the stratosphere on Nov. 5, 2012 (one day before Election Day) using a weather balloon. "We estimate that the balloon reached 120,000 [feet]," Earth to Sky Calculus, a group of middle- and high-schoolers from Bishop, Calif., wrote on Facebook Wednesday. "It was a crystal clear, gorgeous fall day in the western United States!" Onboard cameras documented the flight, recording the dolls' rise into the skies over east-central California and their dizzying descent after the balloon popped high above the Earth. One video of the Obama and Romney dolls' flight, in fact, captures the transition from serenity to chaos after the balloon pops. The Obama doll's head is peacefully surveying the desert-mountain landscape one moment and bobbling furiously the next. Monday's launch wasn't the first balloon flight for some of the Bishop schoolkids. They also lofted a balloon in early September, as part of a project called The Golden iPod. The Golden iPod is a nod to the Golden Records aboard NASA's Voyager spacecraft, which launched in 1977 and are now nearing the edge of interstellar space. The records are meant to provide any aliens who may come across them an introduction to our species and our planet; they contain selections of some of our most celebrated music, greetings in 55 different human languages and much more. "We plan to fill our iPod with the best humanity has to offer — old and new," team member Anna Herbst said in a statement. "Then, if all goes as planned, we're going to send it to space."